IUCN Red List Status: Least concern. Distribution: widespread throughout most of Europe including Britain and Ireland; they are most common in the south and west; scarce in East Anglia, parts of Scotland, urban Midlands. Habitat: deciduous woodland, farmland and some large urban gardens and coastal cliffs. Size: Male:- head and body up to 76cm (30in); tail 15cm (6in). Female smaller. 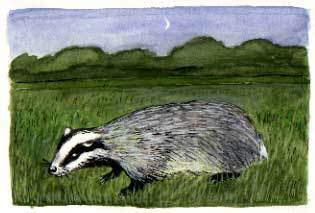 Population: A survey of badger dens was conducted across England and Wales between November 2011 and March 2013. The ‘estimated abundance of social groups’ was 71,600, an increase of 88% since the last study in 1985-1988. Description: stocky grey body, short tail; distinctive black-and-white striped head with small white tipped ears. Food: omnivore (both meat and plant eater); earthworms are the main food; also beetles, slugs, wasp grubs, frogs, young rabbits and mice, fruit, bluebell bulbs.